Following the global reveal of the new generation BMW 3 Series, the forthcoming plug-in hybrid is shown as offering a 45-mile electric range, low CO2 and fuel economy. 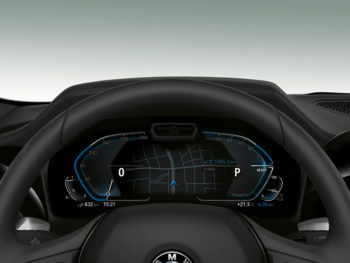 A 45-mile electric range is indicated, a rise of 22 miles over the outgoing model, and is a similar increase to the expected electric range provided in the next-generation of BMW X5 iPerformance plug-in hybrid thanks to a battery capacity increase though the exact kWh increase and weight penalty are yet to be confirmed. The X5 will be equipped with a 3.0-litre six-cylinder petrol unit outputting 282bhp alongside an uprated electric motor with 110bhp making a combined power output of 388bhp and 442lb.ft torque, though it remains uncertain whether the new 330e will benefit from similar treatment or stick with its 2.0-litre four-cylinder unit. Emissions are provisionally rated at 39g/km keeping tax low, while fuel economy is rated at 166mpg, though it is worth noting these are NEDC-correlated figure and will therefore change on 1 January 2019. For comparison, fuel economy and emissions for the outgoing 330e are 44g/km CO2 and 134.5mpg (NEDC), while the competing Mercedes-Benz C 350 e offers 48g/km CO2 and 134.5mpg (NEDC).